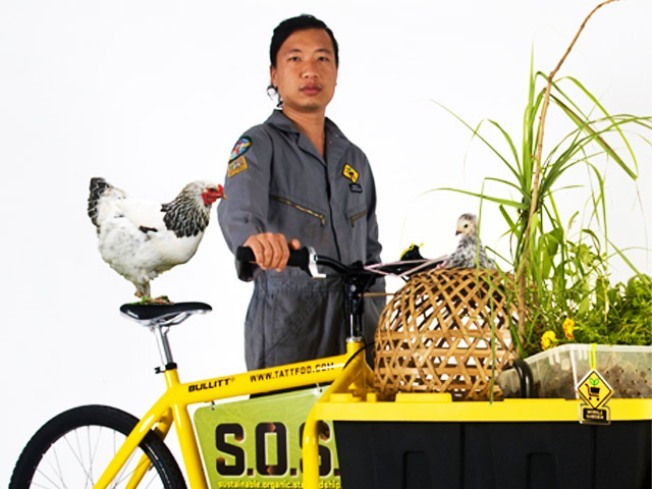 "Urban farming artist" Tattfoo Tan will be at Farm City Fair with his S.O.S. (Sustainable Organic Stewardship) mobile classroom. E-I-E-I-O: The Farm City Fair makes the county fair decidedly urban, with a daylong celebration of art and food grown in Brooklyn. Browse a market of the borough’s small-batch artisanal food purveyors, watch home cooks face off using locally-sourced ingredients at the Brooklyn Roots Experiment, and much more—including Brooklyn-created cocktails and eats from Chefs from The Meat Hook, Ted & Honey, Egg and others. Invisible Dog Art Center (Boerum Hill), Sunday,11AM-5PM. BOOTS ’N ALL: It’s a veritable stampede of torch, twang and ruckus as the 7th Annual Brooklyn Country Music Festival kicks up its heels starting Friday, with live shows all weekend at Southpaw. The acts are all local, playing all original music, stresses organizer Alex Battles (he of the band theWhiskey Rebellion): “heartbreaking, footstomping aggregations of four chords and the truth.” Amen. Friday-Sunday, times vary; see full schedule. PAGING NYC: Not only are all events free at the Brooklyn Book Festival, there’s no shortage of cool people signed up to participate: Hear musically-inspired readings from Colson Whitehead(Sag Harbor) and Rob Sheffield(Talking to Girls About Duran Duran), witness one-on-one chats, like author/Rolling Stone scribe Jancee Dunn interviewing Roseanne Cash, and even get a little hungry, courtesy of chefs-turned-cookbook authors Frank Falcinelli and Frank Castronovo. Sunday, starting at 10AM; see full schedule.